We don’t get a huge selection of autumn fruits here in NC. Once grape season is over, we have apples and that’s mostly it until strawberries make their appearance in April. Not that I don’t like apples, but it’s nice to have something different. So I was very happy when Asian pears showed up on our Produce Box menu for this week! I had never eaten Asian pears, which are a bit crisper than Bosc pears and not as cloyingly sweet. These pears though, they have a visual marketing problem. Asian pears look like brown apples, so even if I had seen them at the market, I probably wouldn’t have purchased them. And that is too bad because they are delicious, refreshing and healthy. We used one of our awesome pears to make this fresh, fall salad of organic, local lettuce, kale, dried organic cranberries, and goat cheese. It was delicious, and a nice break from all the squash we’ve been eating! Toss together the lettuce and kale and divide among two serving plates. Top each plate of greens with equal amounts of pear, cucumber, radish and cranberries. Divide the goat cheese and sprinkle over the plates. 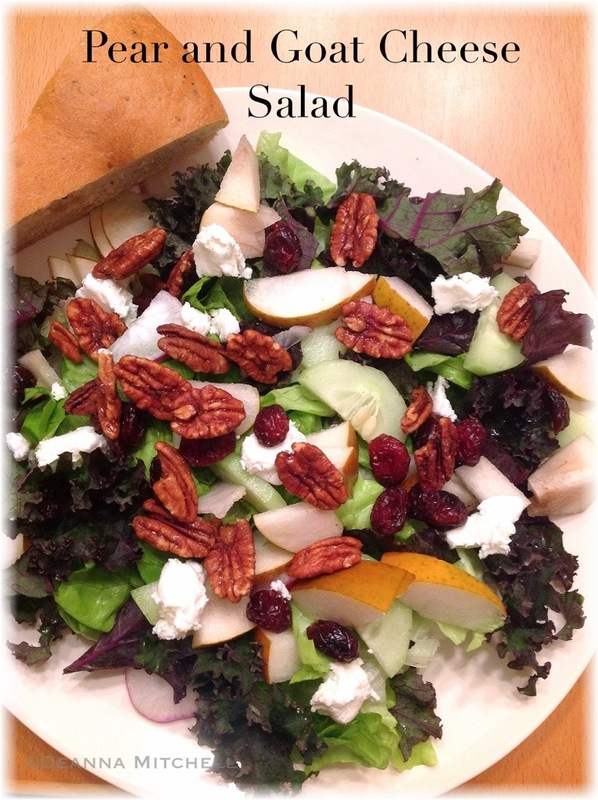 Top each plate with pecans and serve immediately with dressing on the side.